This was a tough year for me and gaming. Between work, buying a house and moving 863 miles away from work and my primary social circle, I didn’t game as much as I had in previous years. I continued my love–hate relationship with Blizzard and World of Warcraft, which found me more on the hate side of things in 2007. Russell Williams, CEO of Flying Lab, took the time to respond in detail to my first post which discussed my impressions of the Pirates of the Burning Sea. I've reposted his comments separately to raise reader's awareness of his responses, especially since his second comment was hijacked by a misconfigured spam filter I recently setup. His opportunity to respond to a potential customer's concerns regarding their game is one of the great things about the Internet and blogs in particular - they give people an easy medium for communication and discourse. Russell's comments are in reference to my first post which you can read here. Hi, I just came across your first impressions of Pirates, and I thought I'd address some of your points. 1) Female characters use the same body structures as men - Obviously we'd love to have a different rig for both, but we also wanted a pretty in depth level of character customization, so we wanted to spread that content across both men and women. We were also limited in our ability to change those rigs because our characters are more real world than other games, specifically how the clothing drapes across them, which makes it pretty much impossible to do it algorithmically (as opposed to CoH). This isn't to say that I'm unhappy with how they look - the reaction has been relatively positive, but that's not to say there's not room for improvement. It's also possible that your graphic settings could be set unduly low (a bug earlier in beta) which can really impact the look of our avatars. Drat and double drat, I've been doing some reconfiguration of the blog - back end and front and somehow managed to trap some user comments in a spam filter which I didn't notice I needed to check. Anyway, sorry for those that commented but never saw them appear. I've pushed them all into production now. I'm especially disappointed that a comment from Russell Williams of Flying Labs' comment (PotBS) was trapped in my little misconfiguration warp. On another note, some of the comments are displaying newest at the top which is driving me bonkers. I'm still working on sorting things out..
As the Pirates of the Burning Sea BETA (PotBS) comes to a close, I’ve quested, tested, PVP’d and crafted. 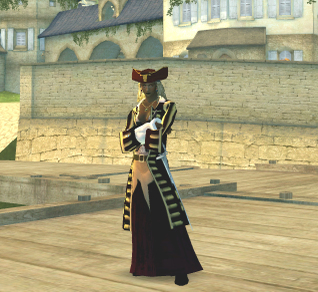 I branched out from my original character who was a Free Trader to try Naval Officer, Privateer and Pirate. I moved away from being PVE focused to initiating combat with NPCs to establish unrest and PVP targets to see how I’d fare. If I had to give it an all around rating on its appeal in my humble opinion, I’d say PotBS probably rates 6 out of 10. Again, this is highly predicated on personal priorities and preferences. Turbine announced the planned closing of Asheron’s Call 2. Shortly thereafter, our guild leader left the game and the guild began to dissolve. My anger over how the player community was treated and deceived, right up until the revelation that the game was closing, left a sour taste in my mouth for all things Turbine. Lots of anger, disappointment and sadness came over me, and I made an early departure from the game with the thought that I’d never play another MMORPG again. Too much time and emotion invested in a world over which you have little control. My first foray into virtual fantasy worlds began with Asheron's Call 2. I tried AC1 a few weeks before AC2 was to release. I liked the game play but wanted the updated graphics. As soon as AC2 was available I jumped ship and never looked back. 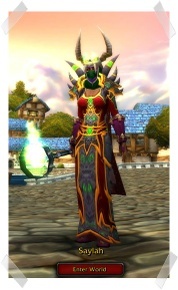 I guess no other game will make me feel the way I did in this, my first MMORPG. The wonder and awe, the blessed memories of adventuring with friends. I’ve subscribed to EVE Online (EO) three times and never stayed more than a month at any given time. On an episode of, "Shut Up. We're Talking." Brent made a comment about EO not being fun. It was something along the lines of it being a great game but it's not fun. I don't agree with the not fun part and I'm not sure that's exactly what Brent meant either. I think his lack of enjoyment (fun) comes from something else, and that something else is the reason I don't stay - the player gap. The gap between new player and veteran is astronomical and the amount of time required to bridge the gap seems insurmountable – so I leave. Truth be told, time investment or no, there are some aspects of the game for which it's virtually impossible to catch up to veteran players unless they leave the game for a long span of time. I wanted to like this game – I still want to like this game. It’s strange. I felt bad about not liking it – beyond my own disappointment. I thought about seeing what other people thought before posting my own impressions. Then I decided against that because this is a blog – my blog, and should be about my impressions. Good, bad or indifferent, my own opinions are valid as just that – my opinions. Playing in the Pirates of the Burning Sea (PotBS) BETA left me with some impressions that inspired this post. I’ll leave my BETA specific thoughts for another day, however. From where I sit, there are three games that comprise the Holy Trinity of the MMORPG market in North America and Europe – World of WarCraft, Everquest 2 and EVEOnline. Other notable games are GuildWars and Dark Age of Camelot, along with niche games like City of Villans and City of Heroes. It’s my impression that these games combined represent the lion’s share of the gaming space.